From email header read “… from username@gmail.com on behalf of customaddress@mydomain.com”. 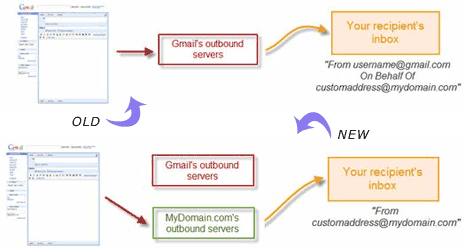 Gmail has finally added feature to remove “on behalf” mechanism and allow you to use actual custom SMTP server for all outgoing emails. Under new setup from header will read “… from customaddress@mydomain.com”. No more “on behalf” to cause confusion and doubt to email recipients. 2. Click Settings at top right. 3. Goto to Accounts tab on settings page. 4. Click “edit info” from “Send mail as”. From now one you can use the existing “on behalf method” or switch over to this new method of using custom SMTP server showing different email ID on outgoing emails – take your pick! How to hide or remove labels next to subject line in Gmail inbox?